This is what it’s come to — there are now Americans who have lived through two gun massacres. Many of the people who were able to flee a California bar where a man shot dozens of people late Wednesday night had also survived an attack last year in which a gunman in a Las Vegas hotel fired down on a music festival, killing 58 people. But at least one of the Las Vegas survivors was among the dead at the bar. If Ms. Pelosi and Mr. Trump are sincere about coming together to fix problems the public cares about, there seems hardly a more pressing place to start than reducing gun violence. But Mr. Trump is the ideal president to tackle the issue. He enjoys the adoration of his party’s culturally conservative base to a degree few politicians even approach. If inclined, he could burn just a small fraction of that capital on promoting some of the common-sense gun measures desired by a majority of the electorate. Better still, since Mr. Trump has a taste for combat and prides himself on shaking things up, what could be more disruptive than pressuring lawmakers to grow a spine and attack gun violence? As legacies go, Mr. Trump — and Ms. Pelosi and her colleagues — could do far worse. Pray tell, what new laws would have stopped the shooter, who apparently had mental issues following deployment to Afghanistan? He was over 21. He passed a federal backgrounds check. He did not use an “assault rifle.” Depending on which you read, California is the most gun restrictive state in the nation. They have everything that Democrats have been calling for. The only thing they’re missing is just simply banning possession of firearms by private citizens. They have red flag laws in California, as well. The Washington Post Editorial Board is likewise pimping gun control. What would have stopped this? This entry was written by William Teach and posted on at 6:32 am and filed under 2nd Amendment, Democrats, Donald Trump. Bookmark the permalink. Follow any comments here with the RSS feed for this post. So nothing can be done to stop mass shootings in public spaces? Should we have any gun control laws at all? If so, which ones? How do other nations avoid a surfeit of mass shootings? OK. Buckle up it’s going to be a bumpy ride from here on. Perhaps the past few weeks are an aberration and things will simmer down now that president trump is past his mid-term blustery incitements. Perhaps. Would have been fun if Mrs Carlson had a shot gun or an AR-15 had Antifa beaten down her door. There’s a mass shooting we all can love. 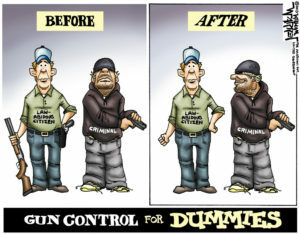 We do have gun control laws; convicted felons are legally barred from possessing firearms. Other nations take away the right to keep and bear arms from law-abiding citizens, which is what I’m sure you would like to see here. Donald J. MacLeod, 79, recalled a night early last year when he and his wife were getting ready for bed around 9 p.m. Long and his mother, Colleen, were shouting, and dogs were barking. He didn’t report the incident. But another neighbor, Tom Hanson, 70, called police in April when it sounded like Long was tearing the house apart. Hanson was worried that Long would hurt himself. Ventura County Sheriff Geoff Dean said Long was irate and acting irrationally. The mental health crisis team that was called in to evaluate him discussed that he might have PTSD, based on his military service. They concluded he did not need to be taken into custody. Dean said Long had several interactions with deputies over the years but was never arrested or involuntarily detained for a mental health evaluation. Richard Vargas, 29, said he attended El Modena High School in the city of Orange with Long and played on the same freshman basketball and baseball teams. What possible societal benefit accrues by having a man with this history possessing firearms? Shouldn’t our laws keep firearms out of the hands of the mentally ill? Then maybe we should open up the mental hospitals the Lefties closed. Law enforcement was called, interacted with him, but, just like Nikolas Cruz, no actual action was taken. Hint: when discretion is possible, it’s always easier to do nothing. Our laws do say that the mentally ill should not have firearms, but Mr Long was not deemed mentally ill, nor “involuntarily detained for a mental health evaluation.” Legally, he was as sane as you are. That’s the problem with the gun grabbers: your ‘solutions’ all seem to do with taking away the rights of people who have not been adjudicated as criminals or mentally ill. Teach, will you have somebody do something about this stupid Reply widget? Pirate's Cove is powered by Pure Neocon Pirate Evil. Oh, and WordPress 5.1.1. Delivered to you in 0.770 seconds.